I was wearing an amazing pastel creme on my fingers for probably 4 days when I finally took it off last night. Since it came in my Julep box I was saving that swatch for that post, when I have time to try on all the polishes. So last night I was craving something a little different, something richer and darker. I originally put on a dark red and wasn’t feeling something so vampy. So I opted for a lighter but richer color that I haven’t worn since last spring. 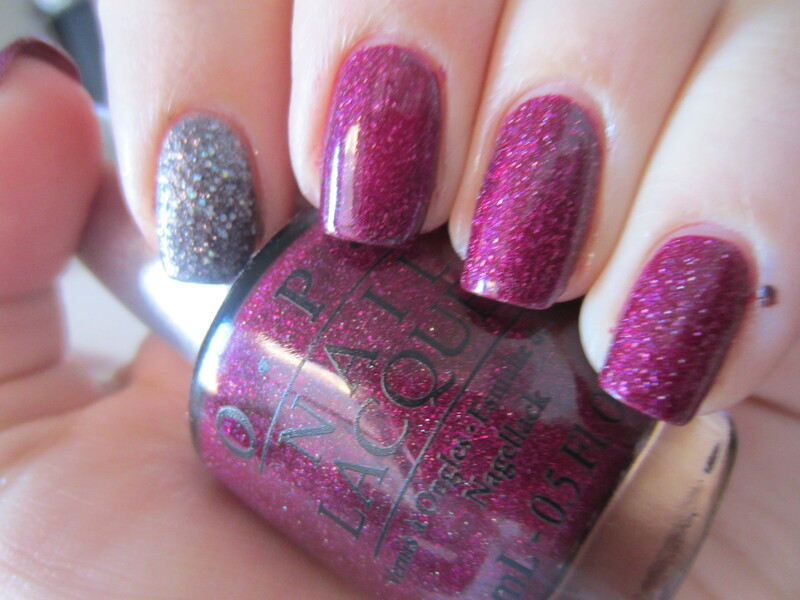 OPI Designer Series Extravagence is a dark magenta polish that has amazing shimmer and holographicness to it. The holographic shimmer in this polish isn’t a linear holo, its scattered and not strong at all. But it gives it this amazing shimmer and depth to the polish. It almost looks like this polish is glowing off my fingers. Any light that hits this polish makes it glow bright pink from the inside out. Then in bright sunlight every color of the rainbow shines. Its one of the few pink polishes that I can honestly say I love. This is 2 coats and honestly is a dream to worth with. Then I couldn’t just have a normal manicure so I had to add an accent nail. I love the way dark pinks and purples look with grey so I picked my favorite grey glitter, Nails Inc “Sloane Square”. I picked this up at Sephora last fall and absolutely fell in love. This is 2 coats and completely opaque. The polish has charcoal and silver glitter with chunky round pieces of holographic glitter. It’s my favorite of all the Nails Inc 3D glitters but honestly, this polish is nothing unique. Don’t spend the money on the Nails Inc because China Glaze and Wet ‘n Wild created exact dupes for this polish. But you should definitely try DS Extravagence because I’ve never found another polish like it. ← My Inglot Freedom System Palette! I have DS Opulence and DS Magic, i want more!